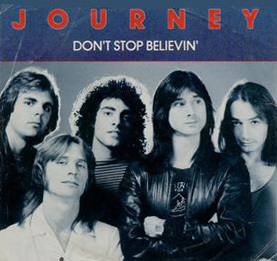 In the US, the journey song don’t stop believin’ was released in 1981 and went to #9 in Billboard. In the UK, the song didn’t chart until it was re-released in 2009 and it reach #6. The song’s title and chorus came from Jonathan Cain’s father. He would end every phone call to his son, a struggling musician in Los Angeles, with the words: “Don’t stop believing or you’re done.” Jonathon Cain joined Journey in 1980. While trying to come up with another song for their album escape, Cain suggested the phrase for the chorus. In 1981, Don’t Stop Believin’ became a huge hit in the US. Then again 26 years later, when it was featured in the final scene of the Sopranos, Don’t stop believin’ was introduced to a new generation and the rest of the world. In a side story, the lyrics mention being “born and raised in south Detroit”, however, there is no South Detroit. The actual location south of downtown Detroit is the Canadian city of Windsor, Ontario.